TBILISI, DFWatch–The government in Georgia says it has not yet prepared an action plan for tackling the currency crisis after a drastic drop in the value of the national currency lari over the last few months. An action plan was expected on March 5, after the conclusion of a visit by officials from the International Monetary Fund (IMF), but Finance Minister Nodar Khaduri said on Wednesday that the government has not yet finished working on the plan. What he could divulge, though, was that there is not planned any increase in fees or taxes, out of concern for the interests of the population. “When it comes to expenses, we will reduce only current expenses. This does not concern capital or social fees,” he said. Khaduri did not specify which parts of the budget are going to be cut. He said the ministry is cooperating with the Economy Ministry and the International Monetary Fund. “We agreed that this year’s expenses will reduce. You also know that we will have to revise macro-economic prognosis. We think that taking into consideration external shocks nowadays economic growth rates of Georgia will reduce to two percent,” he said. Representatives of the IMF mission, which monitored the monetary situation in the country, on Wednesday said at a press conference that Georgia’s economic growth may in fact be reduced to two percent, but even this prognosis carries risks. Among external factors are the crisis in Russia and Ukraine, and the devaluation of currencies among trade partners. As a result, export has fallen by 30 percent and money transfers from Georgians working abroad has been reduced by 25 percent, according to the officials. Due to reduced inflow of foreign currency, the lari has dropped in value by 20 percent since January 2014. The IMF mission’s spokesperson underlined that in the region, currencies have fallen even further than the lari. The team assumes that inflation may increase in coming months due to the depreciation of the lari. Roman Gotsiridze, a former National Bank president, told DF Watch that when government spokespersons say they haven’t prepared an action plan, it indicates that don’t ‘seriously perceive’ the issue. “As it seems it’s a result of a recent slight stabilization of the lari, but problem is not solved. We mustn’t forget that in recent months the lari fell by 20-25 percent,” he says, adding that to halt the value depreciation for a few days is no real solution to the problem. 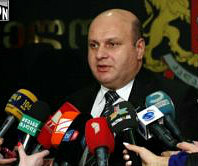 Gotsiridze expressed hope that the government will listen to the recommendations of the IMF and reduce state expenses. The National Movement has long claimed that the country is in crisis and the government is incapable of solving the problems. “This is not a policy and this recent statement proves that they don’t have any plan at all. Meanwhile this country cannot be fixed,” Zurab Japaridze, one of the party’s MPs, told us. Nino Goguadze from the Free Democrats, a party which left the coalition in November and has since become a critic of the government, said that measures must be taken fast. “It seems there are no measures,” she told DF Watch. More than a week ago, the National Movement asked the president to appoint a special session of parliament to discuss the crisis, and bring government members along to answer questions. The president said that at that stage it was not necessary to hold such a session, but the government should prepare an action plan by March 5, and in it show what measures they plan to deal with the crisis. The National Movement then used its right to try to go ahead with a special session despite the president’s refusal, and a time was scheduled for last Saturday at 14:00, but since the Georgian Dream coalition stayed away, not enough MPs were present for it the be valid.